The big rains have more or less stopped here in Santa Cruz. We get a shower about twice a day. Each one has has me holding my breath. The outer wall of my bedroom has been hacked out so that it can dry out and then be filled and repaired and made watertight, we hope. The huge wooden wall unit in my bedroom had one side on the point of collapse when the water soaked through. Now it is being supported by my large weaving sticks. Whine , whine, whine… a picture like this from this blog soon makes you stop. 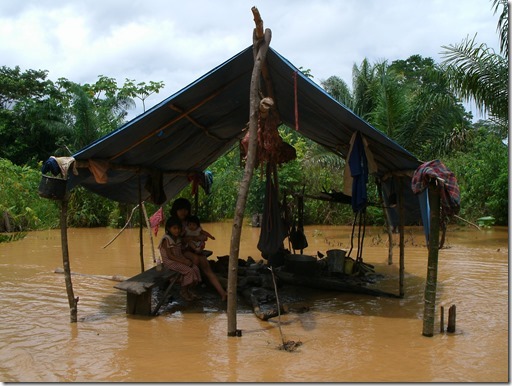 Such is the situation in the province of Beni in Bolivia. No walls at all and sticks support the roof. I heard from my friend Dorinda up in the highlands in the province of Cochabamba, another of the effected areas, but she did not mention the rains and I am guessing that they are okay. Dorinda had written to let me know that she had mailed the box of woven bands that I had ordered from the weaving cooperative that my teacher Maxima heads. 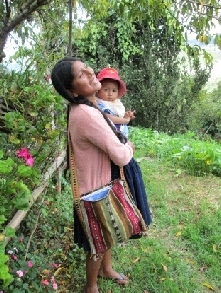 Dorinda blogs about her work with Maxima and the weavers of Huancarani at PAZA Bolivia. Exciting! As the post office box I use is in someone else’s name, I had to be patient and wait for my treasure to be picked up. My home is a disaster of warps, yarn and sticks right now. I really had to resist opening the packages straight away, unfolding the luscious bands, and laying them out to view on every available space. Dorinda included a list of the weavers and each band is tagged with the weaver’s name. She also sent me a document with a short story on each of the ladies. It so nice to handle one of the bands, look at the picture of the weaver and read her story. 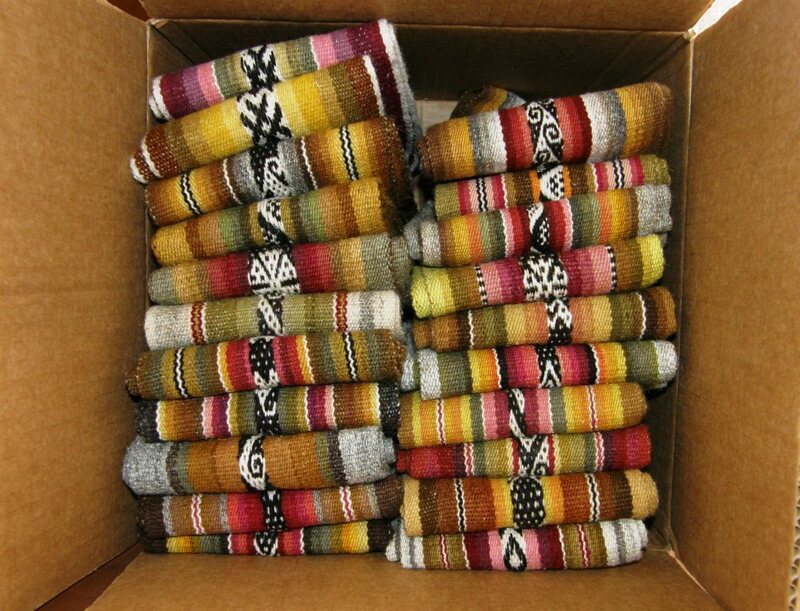 Once I had put things in order, two days later, I opened the packages and released all those lovely aromas of wool, dyestuffs, and “campo”. I like to feel the cloth. The yarn is the weavers’ own handspun, most often made with fleece from their own flocks. The colors are all natural and were created from cochineal and local plants. Which weaver would be considered the best amongst her peers, I wonder. Whose cloth is the stiffest? This seems to be one of the things that the weavers themselves appreciate. I wonder which pattern they would consider the most complex. 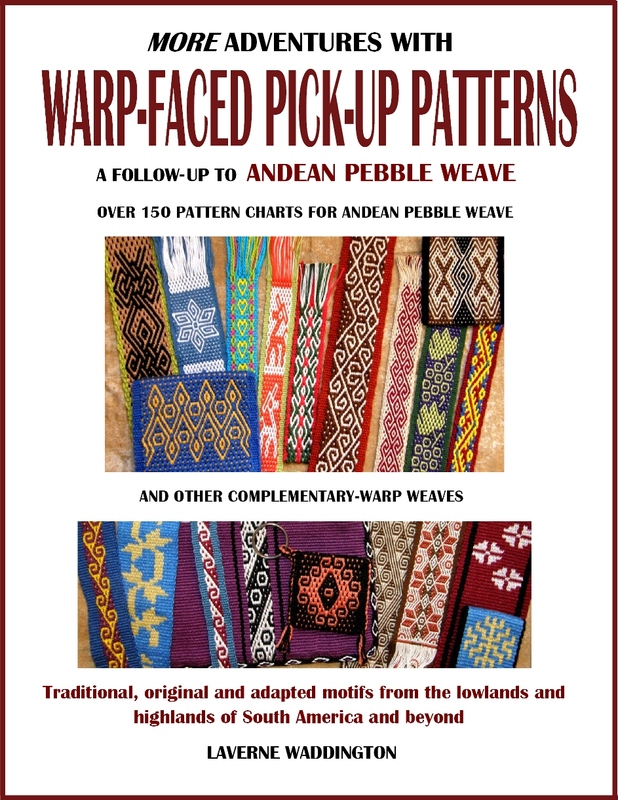 What different effects did they achieve in their use of warp and weft colors? Who matched the weft color to the edge color and who used a contrast color to create attractive little dots along the edge? Whose color combination was vastly different to everyone else’s? Did they all get together and decide not to duplicate the patterns or was that just a happy coincidence? 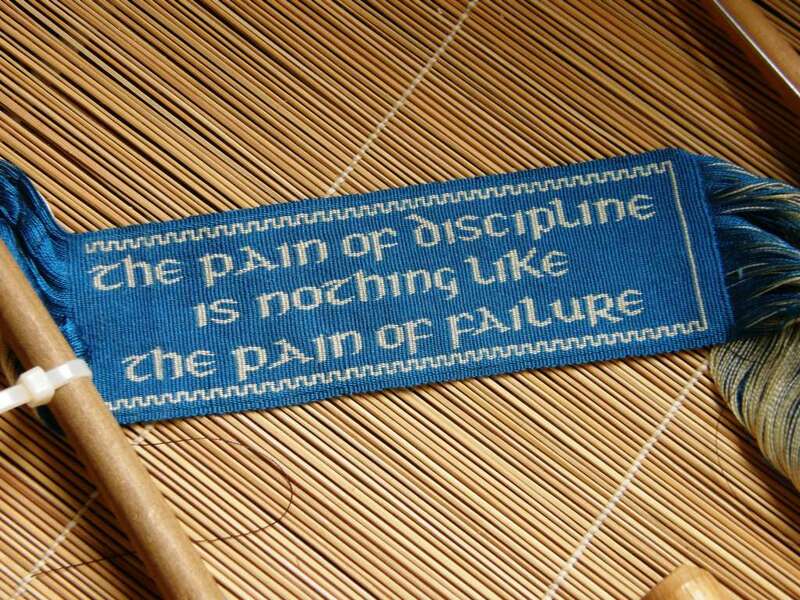 Were any made by the teenagers who are still in training? Without unfolding them, I picked out two which I considered my favorites. 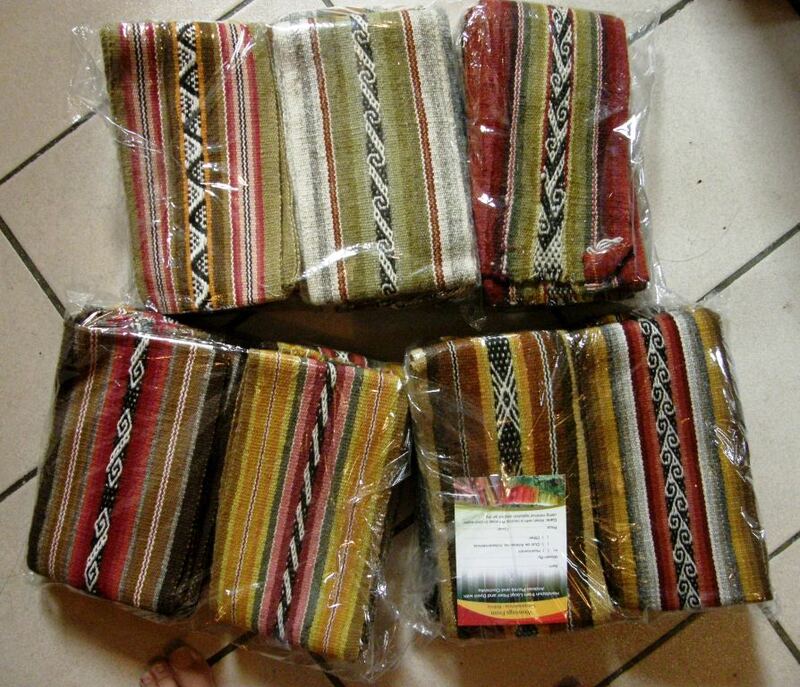 I was happy to see that one of the two had been woven my Maxima. I wondered if I had simply recognized her style. 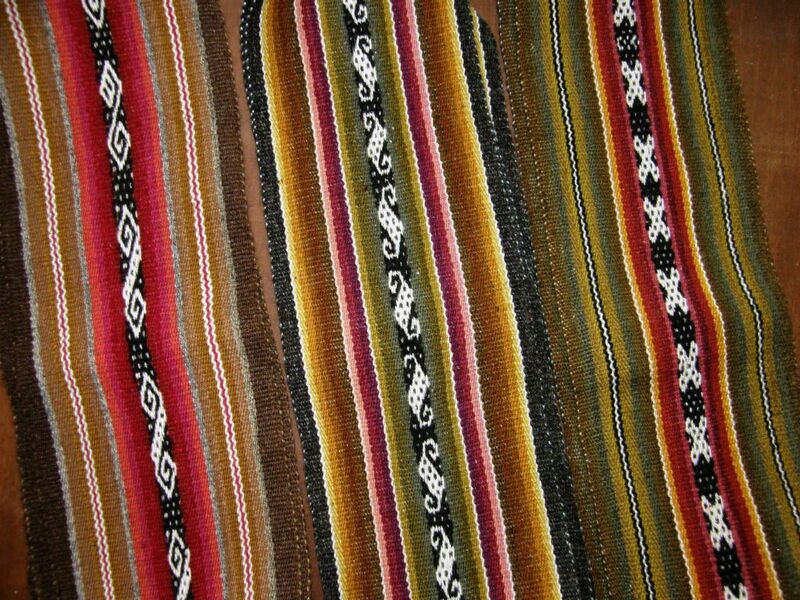 Fifteen different weavers had made the bands with no repetition of color arrangement and just two patterns duplicated. 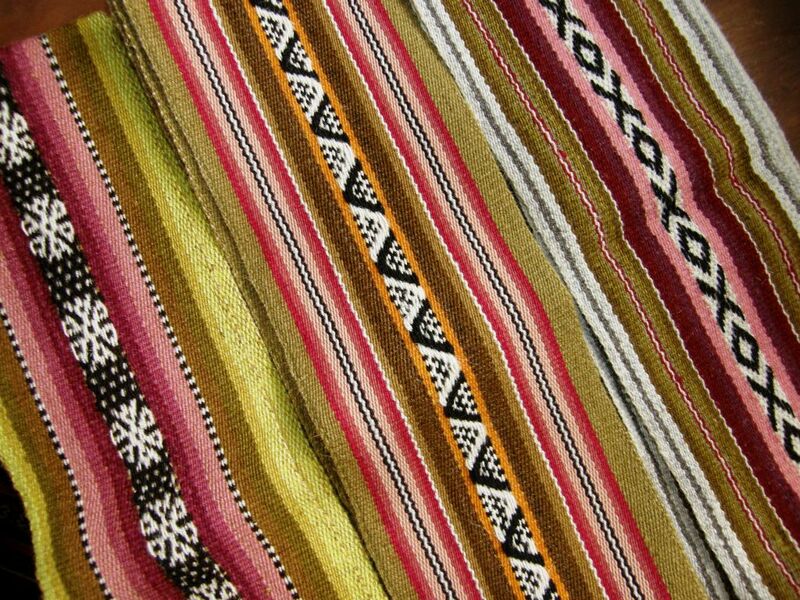 The width of the stripes of color ,and the narrow strips of threaded-in pattern that sometimes separate them, was in a form that was often repeated and could be characteristic of certain communities or even families. Seventeen bands were patterned with complementary-warp designs and three used a supplementary-warp structure. 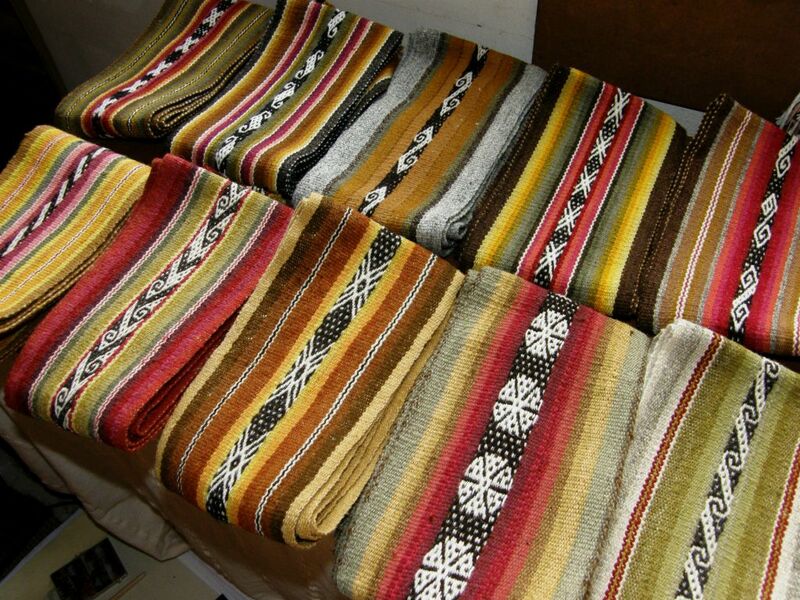 The weavers used a complementary-warp structure to create the patterns on these bands. The band on the right is one of those which was patterned with supplementary warps. The second of the two bands that I had picked out as favorites was made by Narciza, Maxima’s older sister. I just love Narciza’s color combinations. 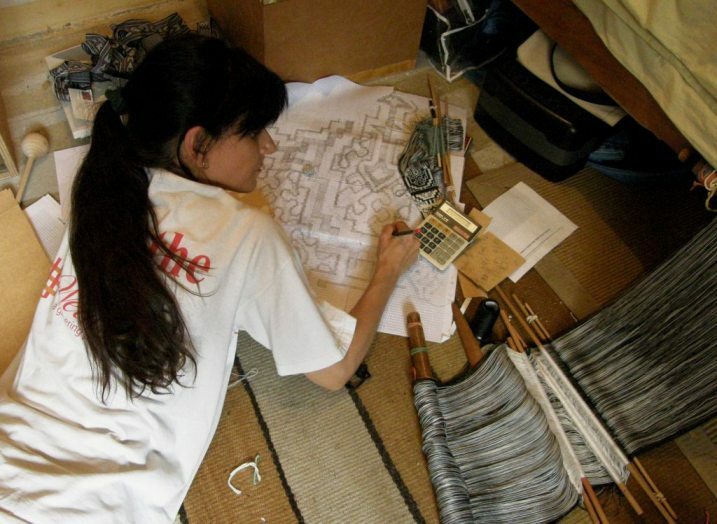 Below you can see her adding a tubular border to one of her woven pieces. 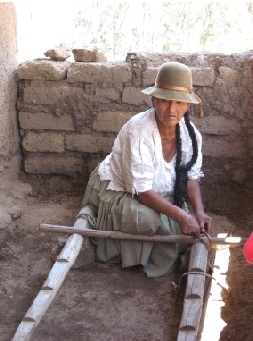 As is done in Peru, she uses a forked stick to hold the cross for this particular type of patterned tubular band. 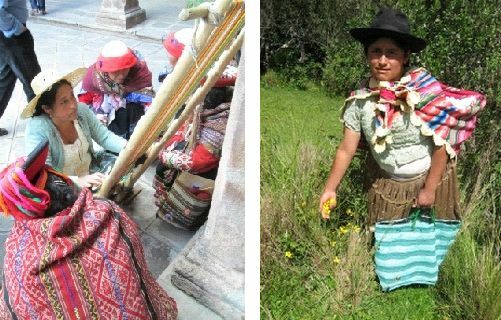 Strangely, younger sister Maxima never learned to weave this kind of tubular band with its distinctive eye pattern and only recently learned it at the Tinkuy in Cusco last year. Dionicia Crespo is the oldest weaver in Hauncarani still weaving to sell at 82 years old! Of course, her fading eyesight plays a role in the straightness of her edges, Dorinda tells me. Her edges look good to me! You can see her at left preparing her frame for warping. Bands that represent three stages of life….you can see 82-year old Dionicia’s band above on the left. 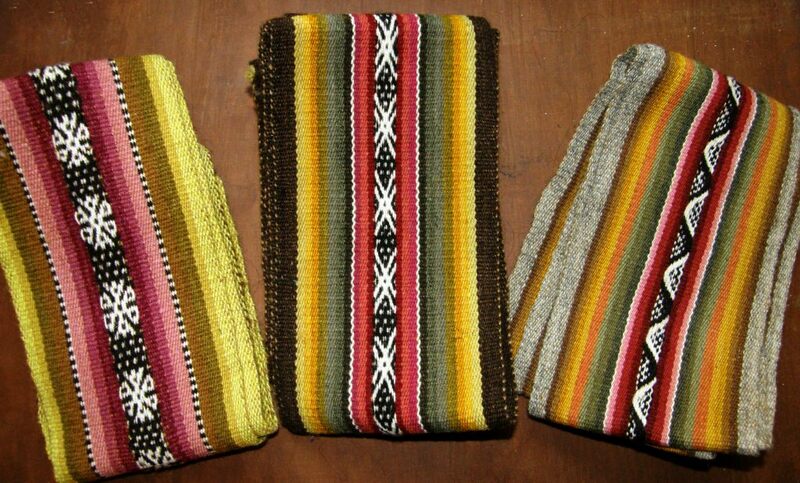 A piece by Vilma, Maxima’s eldest daughter, is in the middle and the band created by the youngest weaver of this collection of bands, 18-year old Adviana, is on the right. 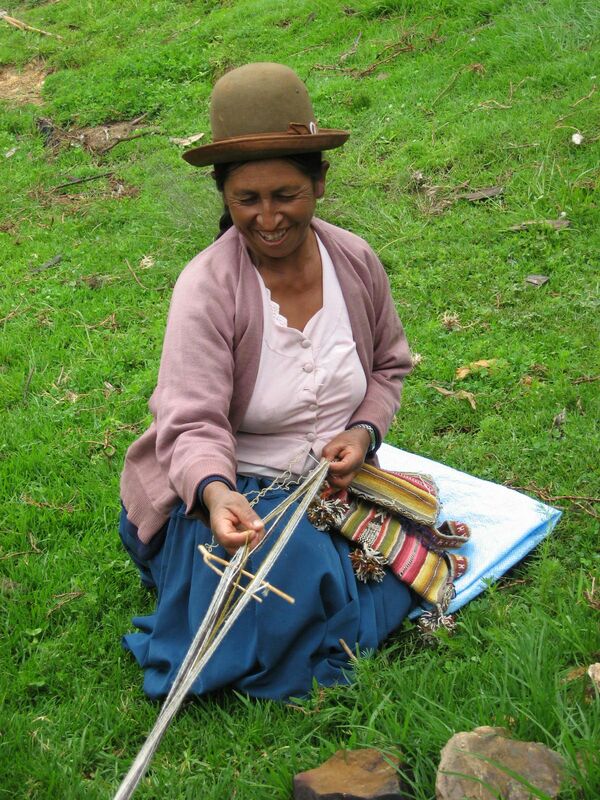 Dorinda tells me that Adviana is one of the few of the younger generation who has learned how to weave. Family traits? The band on the left is Maxima’s, daughter Vilma’s is in the middle and older sister Narciza’s is on the right. Maxima demonstrating at Tinkuy 2013 and daughter Vilma collecting flowers for the dyepot. A couple more pictures to finish before I put the bands back in their box…. Enough color? Let me calm things down a bit now with some black and white. A question was asked in one of the forums this week about what kind of weaving software people use. There are still quite a lot of good old fashioned paper-and-pencil people around amongst those who were excitedly discussing all the ins and outs of the various available programs. Me? I am a paper-and-pencil gal. That’s the new panel for the wall hanging over which I have been dithering. I love charting this way. It makes me feel like a kid again and it is very relaxing. While a young fellow dangled from a cage outside my window and hacked away at my wall, I calmy colored in cells on my graph paper. 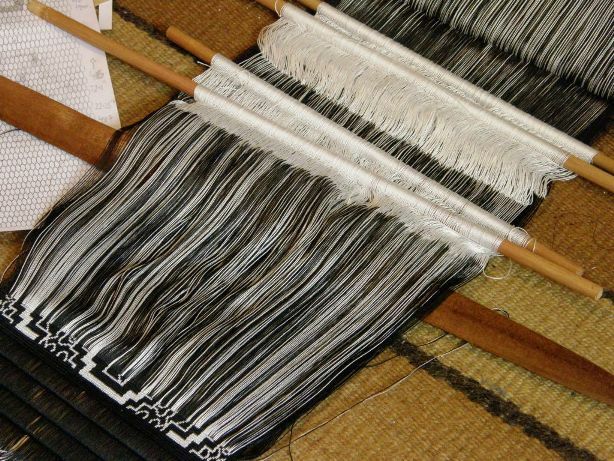 Prior to that, I had just as calmly sat and made four sets of string heddles of 353 ends each on that black and white cotton warp. If you are thinking that that is a weird-looking pattern, you are right! I really have no idea what this will end up looking like even after sampling! I just need to dive in and do it. I fussed over it more than usual….measuring, shifting things about, uncrossing warps, measuring again and finally got the first weft shot in. That always feels good. I am weaving this in double weave. 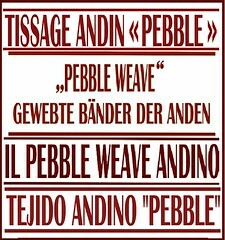 It is embedded double weave as there is a very narrow plain-weave border on either side. I finished the silk bookmark that was part of the Ravelry event but I am calling it a sample for now. There are several things about it with which I am not pleased and, as I have plenty of warp left, I will start it again with improvements. The silk is lovely to work with! Using the four sets of string heddles and a pick-up stick I never have to actually touch the threads. I worked with this same silk as supplementary weft last summer and it was horrid to handle with sweaty hands. The bookmark is light and supple…just the right thickness to slip between pages. I am pleased with all that. Now to fix that other stuff that I don’t like as much. 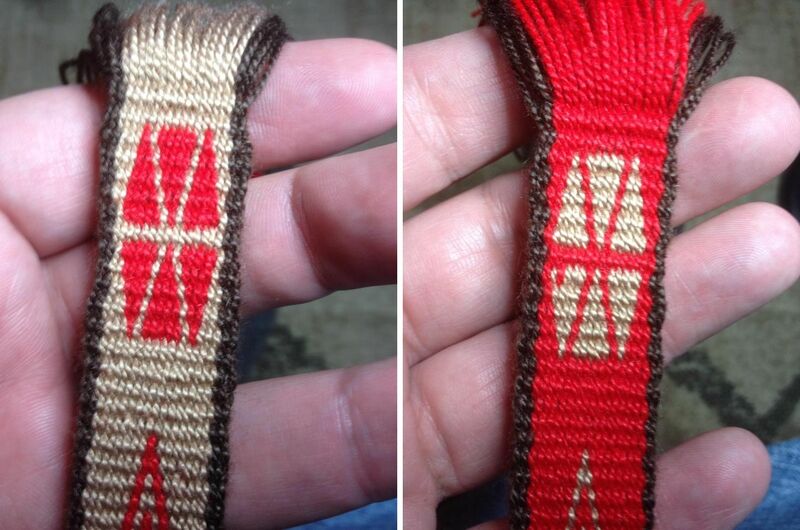 While on the subject of double weave, Scott has allowed me to show pictures that he posted of his double-weave sample band. 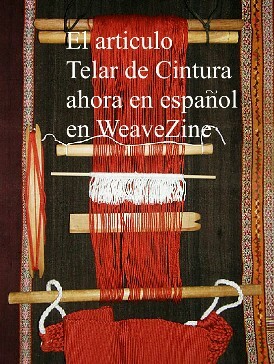 He is studying the one-weft version from my tutorial here and has done a really good job. 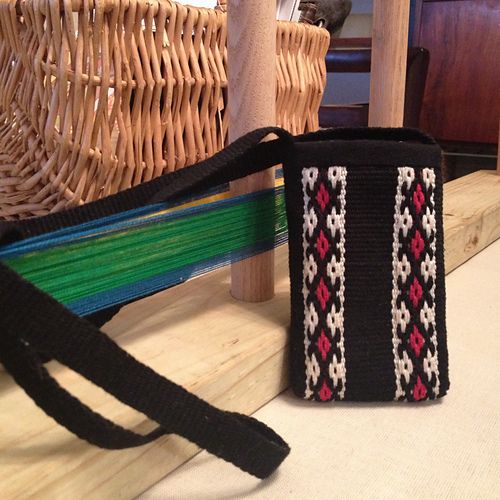 Kim finished her piece and sewed int a small bag for which she also wove a strap. Now she is on the lookout for a button to close it. Joyful has been converting her flowere doodles into patterns using embroidery floss as supplementary weft on her plain-weave band. Julia will use purple cloth with her finished piece along with her sewing talents to create something useful. Another week comes to a close. 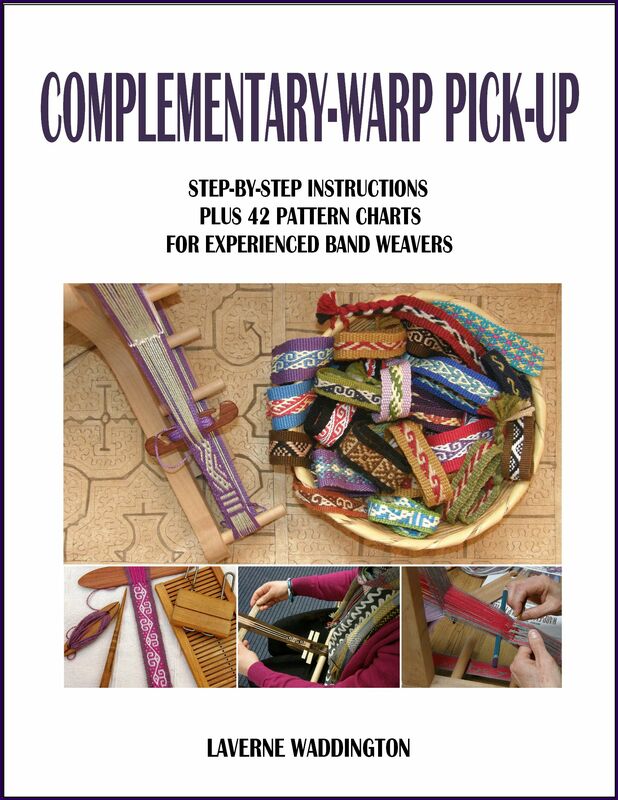 I try and mix it up…a little warping, a little charting, a little weaving for myself. I hope to make some good progress on the wall hanging this coming week. 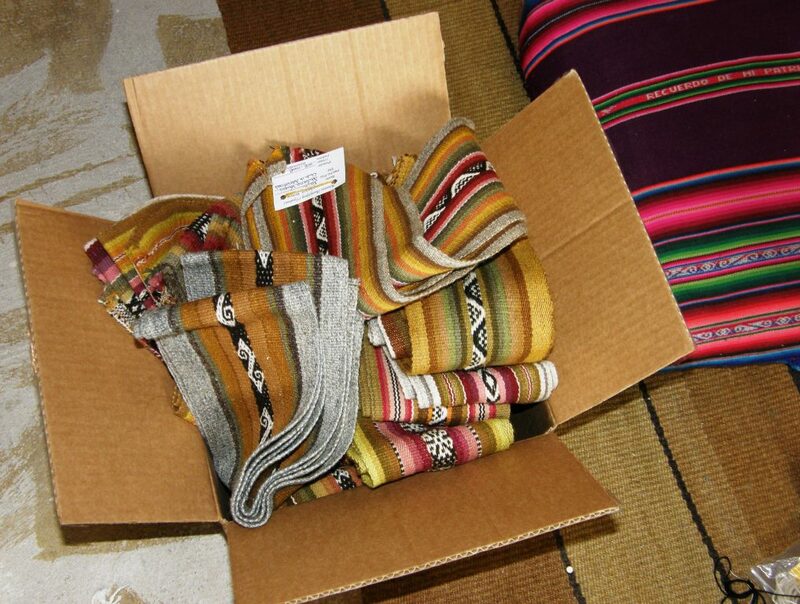 Thanks Laverne, for the beautiful post and photos of the bands of the weaving cooperative. Hope you are staying dry there! Thanks, Anna. As I was writing the post it started to pour! Today we have sun again. What a delight to see the work of the weaving women of Cochabamba. It must have been hard to wait two days before you could open them up and play with them! 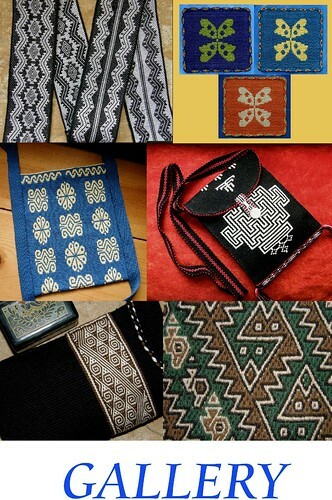 It makes me realize that although the motifs are simple and familiar , each band tells its own story in the many ways those beautiful yarns are used…no two alike! There is joy to be found in taking a simple motif that has been used countless times before and the play of color to tell a new story with it. Thank you Laverne for sharing all these with us. What will you do with them all? Hi Sandi. 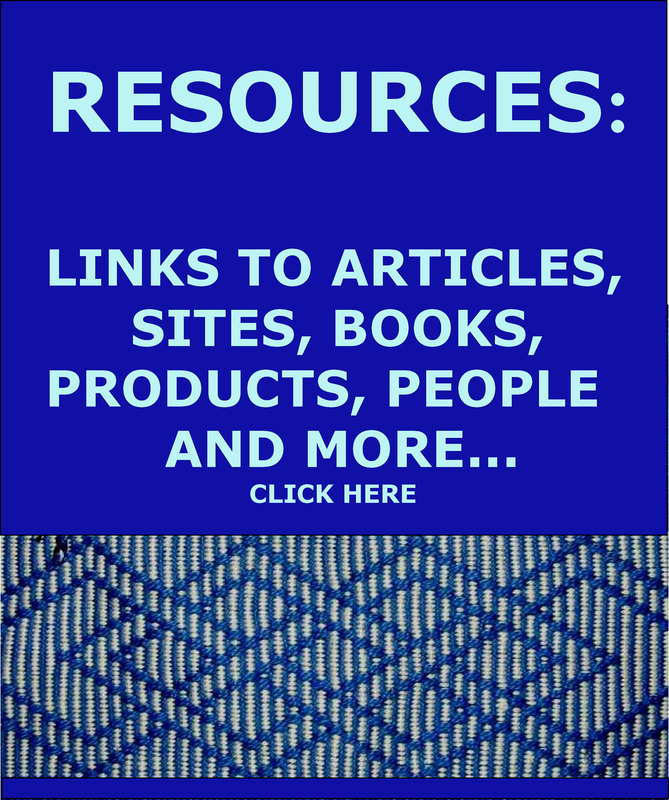 Unfortunately, the PAZA site was “invaded” by something last year and was shut down for a while. It looks like they haven’t got their older pages up and running again. They have not been selling from the site but I can ask Dorinda for you. She has very limited internet access and usually goes to the city (10 hours away) twice a month to check mail. My weaving teachers told me that the little animal is a viscacha. If you google that you are bound to find pictures. I have seen these in the highlands. They are very sweet. I will be bringing some of the bands on my trip so you will be able to see them. Laverne he estado estudiando el telar mapuche con sus tutoriales y quiero mostrarle mis avances donde le envió las fotos? Gracias Teresa. Me encantaria ver tus trabajos. Te mandare un correo. Always a pleasure to read your blog, Laverne. Fascinating to see the different generations of weavers and their beautiful work. I hope your place gets patched and fixed up and causes you no problems with your coming departure.